Recently I got a chance to work on one of the interesting assignments where I had explored BPM APIs, mainly Human workflow related. I want to share my learning in this blog through a series of articles. This article assumes the basic terminology associated with Human workflow, otherwise one can read the documentation here. 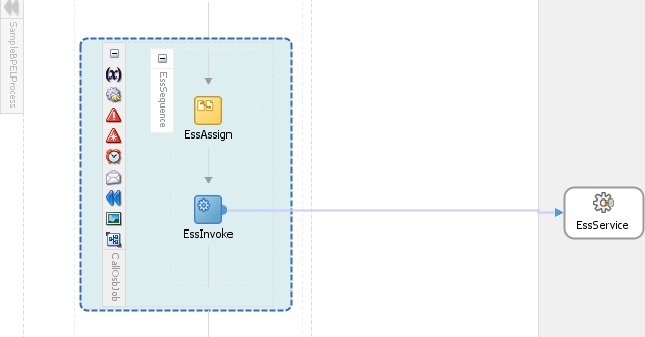 The main focus of this article is to present how notifications will be sent and how many approvals are required for different participant types Single, Parallel, Serial and FYI.I used business rules with Named User, Application Role, Approval Group and Hierarchies (Supervisor/Job/Position) and used 12.2.1.2 version for demonstration. 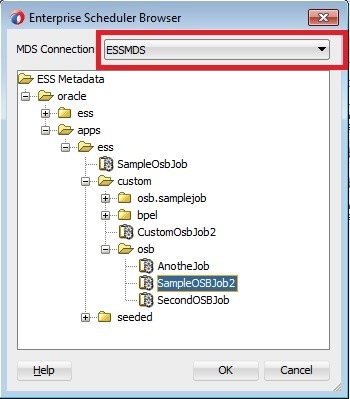 Please note that you should have BPM (just not SOA Suite) installed to try with a few of the assignment types described here. 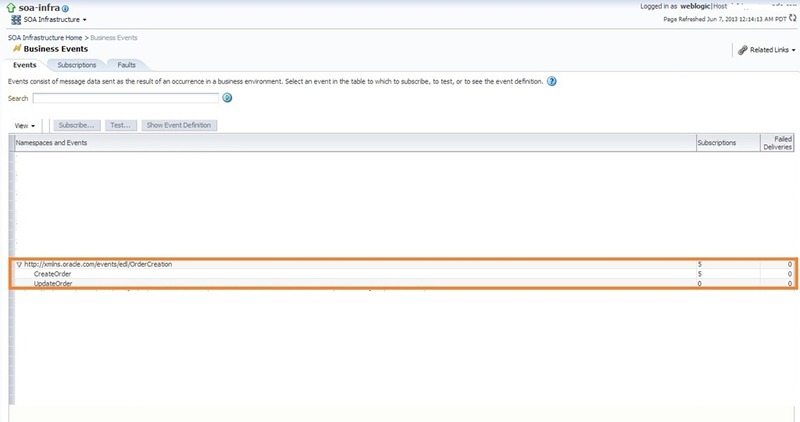 Note that, multiple assignment users can be given for value based setup too. Single Notifications will be sent at same time to all the users derived in rule evaluation. Only one approval is enough for completion. A user may have to claim before providing approval. Parallel Notifications will be sent at same time to all the users derived in rule evaluation. The number of approvals for completion depends on the voting percentage. Chain/Serial Notifications will be sent at same time to all the users derived in rule evaluation as there is no serial relationship defined among users. Approvals from all assignees are required for completion. FYI Notifications will be sent at same time to all the users derived in rule evaluation and no approval is required. 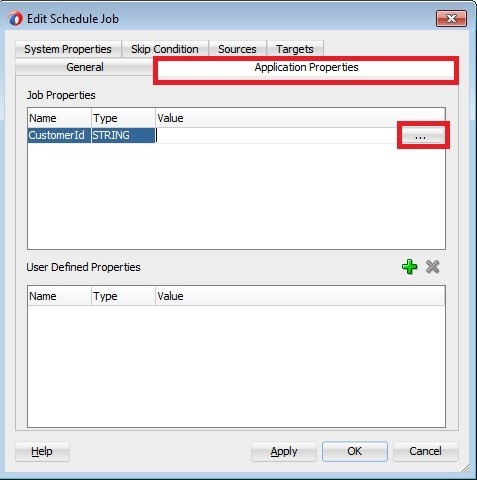 Application Role Single Notifications will be sent at same time to all the users having the application role used in rules. Only one approval is enough for completion. A user may have to claim before providing approval. FYI Notifications will be sent at same time to all the users having the application role used in rules and no approval is required. Approval Group Single Notifications will be sent at same time to all the users of approval group. Only one approval is enough for completion. A user may have to claim before providing approval. Parallel Notifications will be sent at same time to all the users of approval group. The number of approvals for completion depends on the voting percentage. Chain/Serial Notification will be sent in sequential manner as setup in approval groups i.e. if approval group has user1 and user2 first notification will be sent to user1 and then to user 2. Approvals from all assignees are required for completion. FYI Notifications will be sent at same time to all the users of approval group and no approval is required. 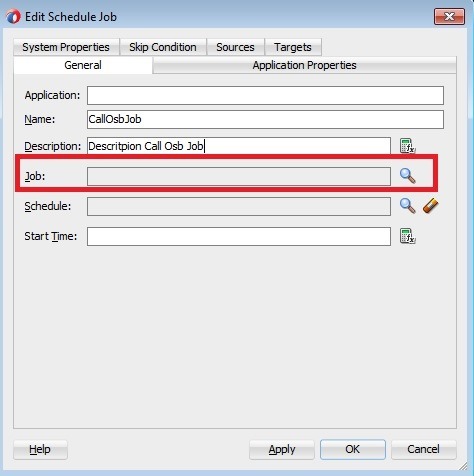 Job Hierarchy Single Notifications will be sent at same time to users part of hierarchy used in rules. Only one approval is enough for completion. A user may have to claim before providing approval. Parallel Notifications will be sent at same time to users part of hierarchy used in rules. The number of approvals for completion depends on the voting percentage. Chain/Serial Notification will be sent in sequential manner as setup in hierarchy i.e. if hierarchy is user1 and user2 first notification will be sent to user1 and then to user 2. Approvals from all assignees are required for completion. FYI Notifications will be sent at same time to users part of hierarchy and no approval is required. The behavior of single participant type is same irrespective of assignment type user, role etc… i.e. only one approval is required for completion. 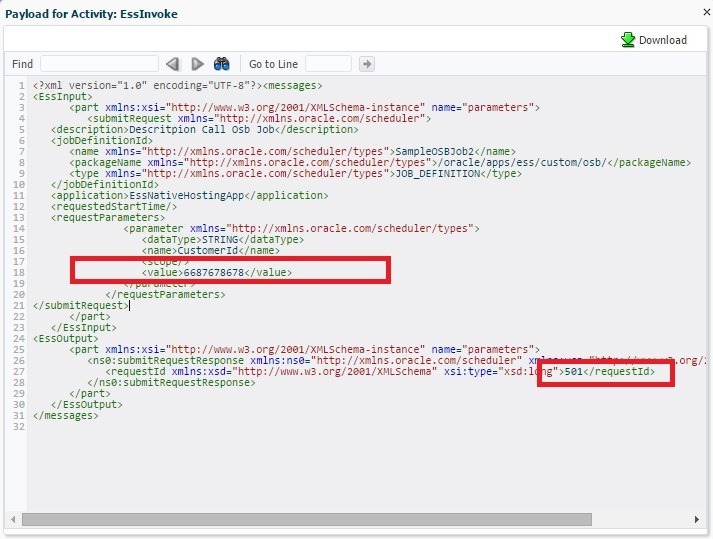 To verify this, do multiple user assignment for single participant type, run human workflow and query WFTASK table. Here we can observe that the ASSIGNEES column having all these users with ‘,’ as separator. The behavior of using application role is same irrespective of participant type i.e. only one user can provide the approval having that application role. To get Chain/Serial behavior we should always go for approval groups or hierarchies. In all other scenarios the serial participant behavior is same as parallel with 100% voting. guaranteed – Events are delivered to the subscriber asynchronously without a global transaction. The subscriber can choose to create its own local transaction for processing, but it is committed independently of the rest of event processing. In addition, EDN does not attempt to resend an event (regardless of the backing store being AQ or JMS). If one or more subscribers fail to consume the event (while others succeed), those subscribers lose the message. one and only one – Events are delivered to the subscriber in its own global (that is, JTA) transaction. Any changes made by the subscriber within that transaction are committed after the event processing is complete. If the subscriber fails, the transaction is rolled back. Failed events are retried a configured number of times. This document shows you business events in action from the perspective of above highlighted points and might help you in choosing the right consistency level depending on the scenario. 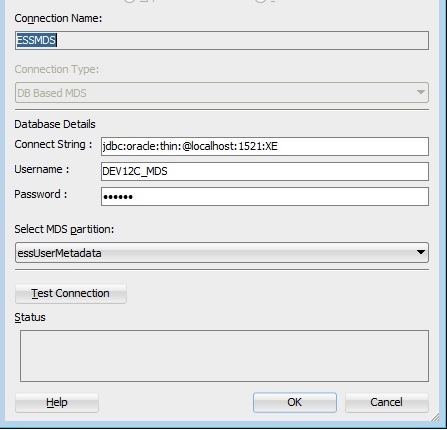 Using EDN-DB, though observations noted here will not vary when used EDN-JMS. 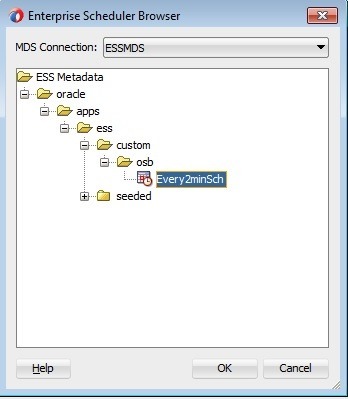 The retry configuration for one and only one subscribed events and the other EDN configuration can be set in EM console by navigating to soa-infra -> Administration -> System MBean Browser -> Application Defined MBeans -> oracle.as.soainfra.config -> EDN Config -> edn. 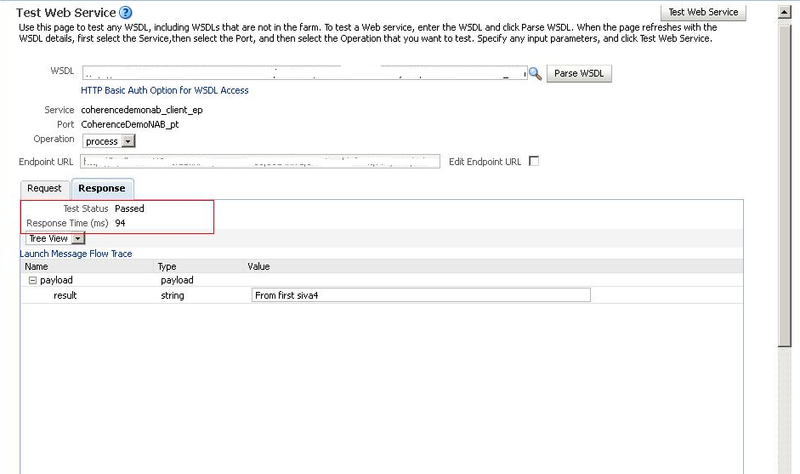 This will bring up the following screen showing the default parameters. 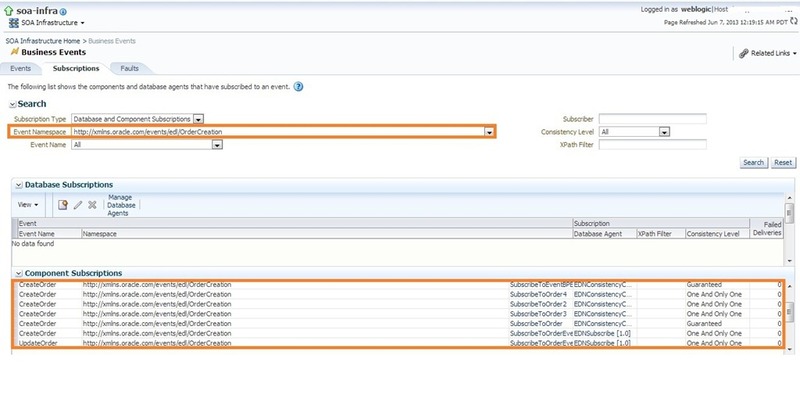 Modify all the event subscriptions to immediate consistency level. Now raise the CreateOrder event and observe flow trace shown below. Since consistency level is immediate and the exception is thrown by one of the subscribers not all of the subscribers have received the event at all. And also no retry happened in case of faulted subscriber. To confirm the above observed behavior, now modify the consistency level of few of the events to either guaranteed or one and only one. Now again raise the CreateOrder event and observe flow trace shown below. We don’t see any change in behavior from previous iteration. So if an exception is thrown by any one of the immediate consistency level subscribers, then remaining subscribers will not get the event at all irrespective of their subscription consistency levels. 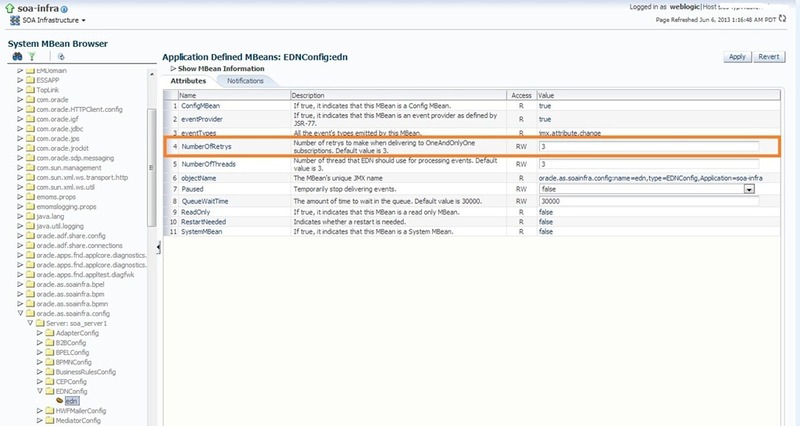 And also we would see the exception thrown back while executing from EM console. Modify all the event subscriptions to guaranteed consistency level. Now raise the CreateOrder event and observe flow trace shown below. Since consistency level is guaranteed all the subscribers have received the event though one of the subscriber is faulted. And no fault is thrown back while testing from EM console as we saw in ‘immediate’ . Also no retry happened in case of faulted subscriber and the event is lost for that subscriber. Modify all the event subscriptions to one and only one consistency level. Now raise the CreateOrder event and observe flow trace shown below. Since consistency level is ‘one and only one’ all the subscribers have received the event though one of the subscriber is faulted. And no fault is thrown back while testing from EM console as we saw in ‘immediate’ . Also retry happened thrice in case of faulted subscriber as we configured the NumberOfRetrys property to 3 (see Configuration section). 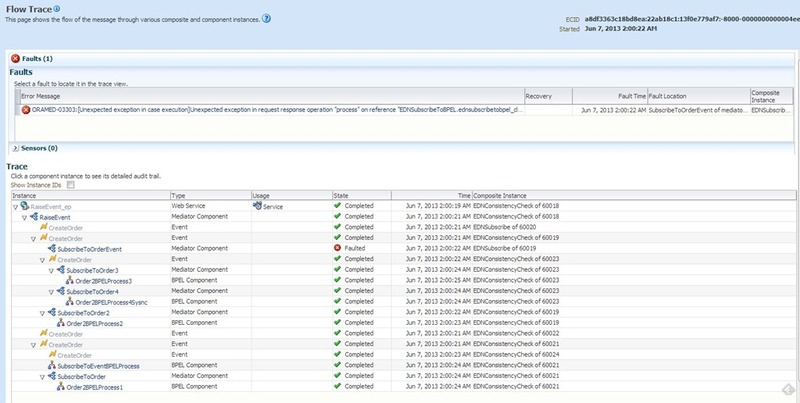 If event delivery is failed even after the configured number of retries that event will be marked for Recovery and will be shown in Faults section of Business Events screen in EM console as shown below. Use ‘Retry’ button to recover the event delivery or use ‘Abort’ button to discard. 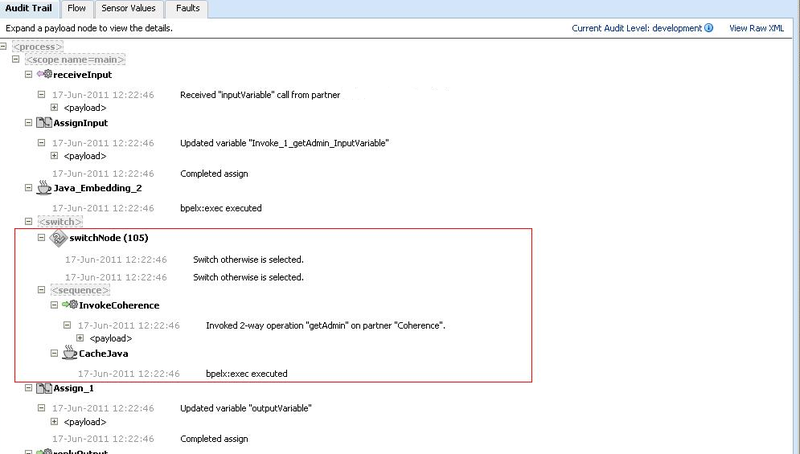 Scenario 1: Mediator routes the request to Sync BPEL which throws fault and not caught, then event retry is happening irrespective of the value set for property bpel.config.transaction. Scenario 2: Mediator routes the request to ASync BPEL which throws fault and not caught, then event retry is not happened as expected, as the fault in Async BPEL process will not propagated back unless we do it by explicit callback and bpel.config.transaction is irrelevant in this case and the value of property bpel.config.oneWayDeliveryPolicy is set to async.persist. 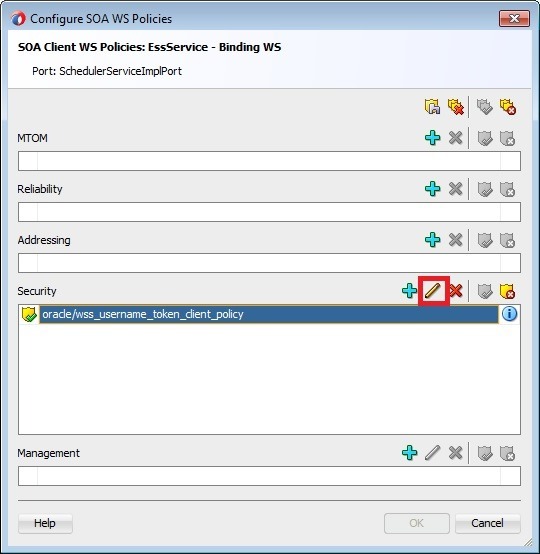 Scenario 3: Mediator routes the request to ASync BPEL which throws fault and not caught having the value of property bpel.config.oneWayDeliveryPolicy is set to sync. As expected, the event retry happened in this case. 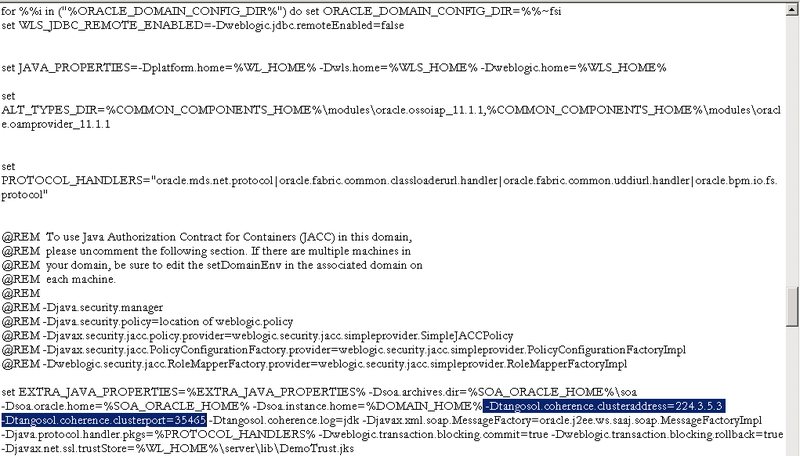 The same behavior isobserved, when BPEL is subscribed to event (no mediator in between) and the value of property bpel.config.oneWayDeliveryPolicy is set to sync. Scenario 4: Event is published and one of the subscribers is not active. In this case, non-active subscriber will loose event and no event delivery happens even after bringing up the subscriber. We will simulate this case using by doing shutdown of another composite. In the below screenshot, we could see that event is not delivered to 6th subscriber as the composite is down and the flow trace will not change even after bringing up the composite. This is due to fact that list of subscriptions no longer has this entry as shown below, so one should think about this type of possibility in real time use cases and have contingency plan in place for such cases. Sample code used in this post can be downloaded from here. 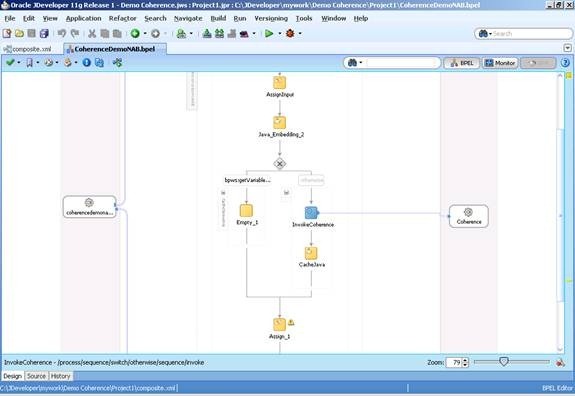 I had a scenario where business event is captured by a mediator in one of the composites and routes it to several BPEL processes in a sequence to complete particular business flow. I had to know the time taken by each of these BPELs in my end-to-end flow. Instead of going through each of the BPEL instance in EM console, I came up with the following query to find out the time taken. I used the ECID to correlate all the BPEL instances generated during my process flow. Check if it’s of help to any. In case of the multiple events, we can rewrite the query if the composites are using sensors. 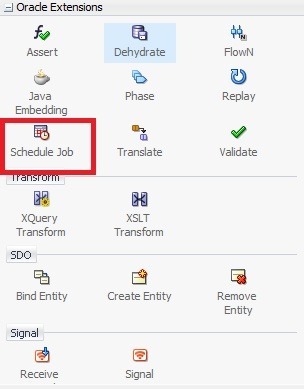 The following query has been used in our case to monitor and to get execution times, minimum and maximum time taken for each of the component in process flow. Note: Based on the requirement, the above select and group by statements have to be commented/uncommented. Recently, we came across a requirement of exposing the BPEL service to be accessible over HTTP without exposing it as SOAP service. We have used the HTTP binding for this purpose. 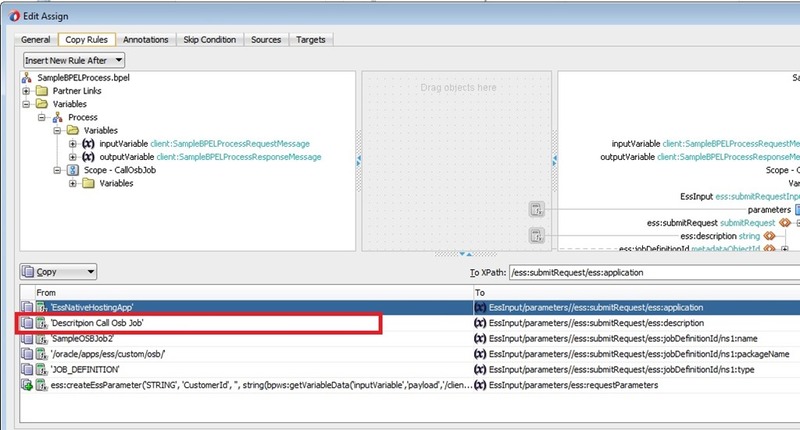 This blog provides the useful information on coming up with actual HTTP url to be used for testing as we faced issues with testing the process from EM console. Just wanted to add simple update on this topic, the URL is working even by giving different name for operation other than default operation name ‘Request-Response’. The same has been tested from SOAP UI (GET method invocation). HTTP Binding can be used in BPEL to call the RESTful services. We might have come across one common error REPLACE_WITH_ACTUAL_URL while calling. Came across a metalink note that talks about this so thought of sharing the same. – Using the XML complex types in the request structure. Though, the metalink url says that XML complex types are not supported it’s working in 11.1.1.5 version ( i verified only in this version). The same working sample can be downloaded from here. The example calls the Echo application which can be downloaded from here (Antony Reynold’s blog). 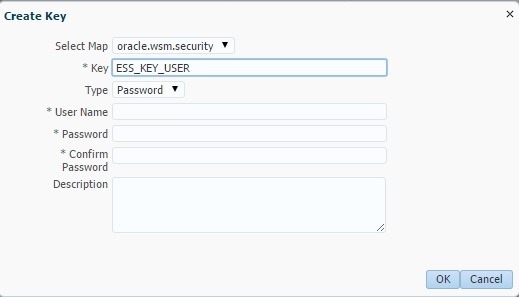 Admin and SOA managed server. Open cache-server.cmd file present in $FMW_HOME\coherence_3.5\bin and set the coherence_home variable as shown below. Replace $FMW_HOME with actual path as per your SOA suite installation. 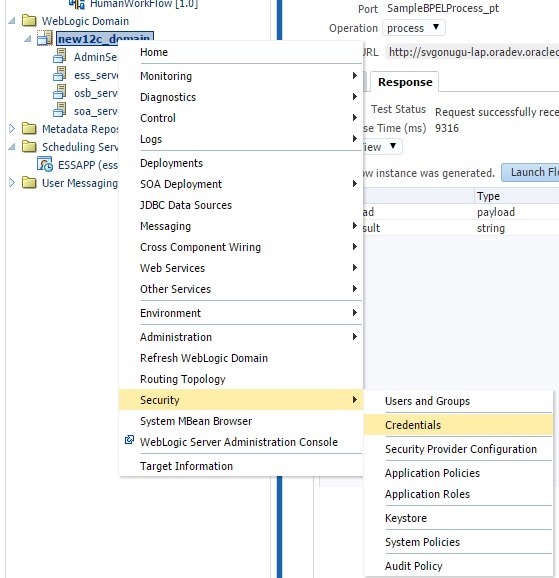 Open command window and issue the following commands to start the cache server. By default, multicasting is used for communication within coherence cluster. 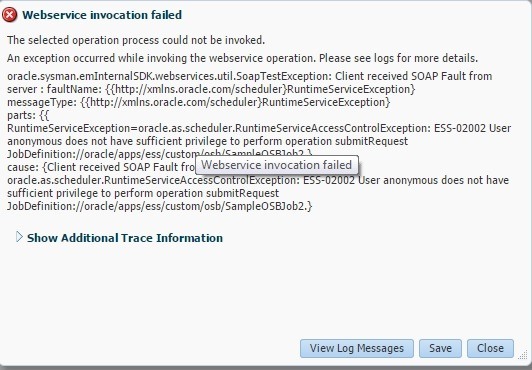 The multicast address and port will be visible in cache server start logs as shown below. In setDomainEnv.cmd file, modify EXTRA_JAVA_PROPERTIES variable to use above multicast address and port. In startWeblogic.cmd file, modify CLASSPATH variable to include coherence jar in server classpath. 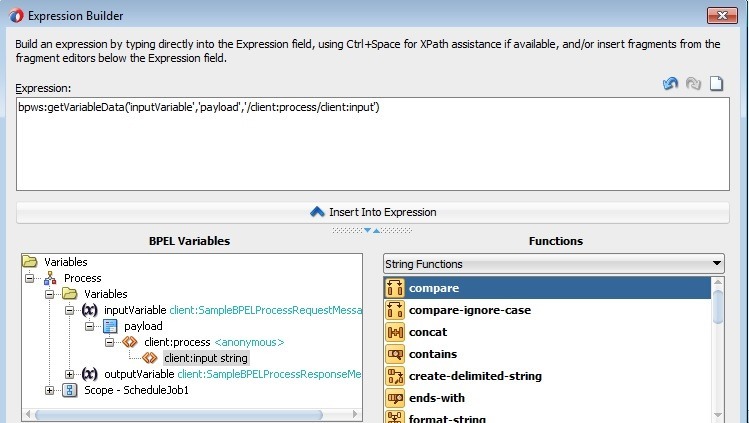 We will create a simple BPEL process to demonstrate the use of coherence API to store and retrieve cache entries. 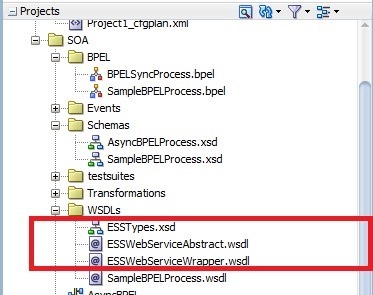 Create a sample SOA project in JDeveloper. Add coherence.jar to project libraries which can be found at location $FMW_HOME\coherence_3.5\lib. 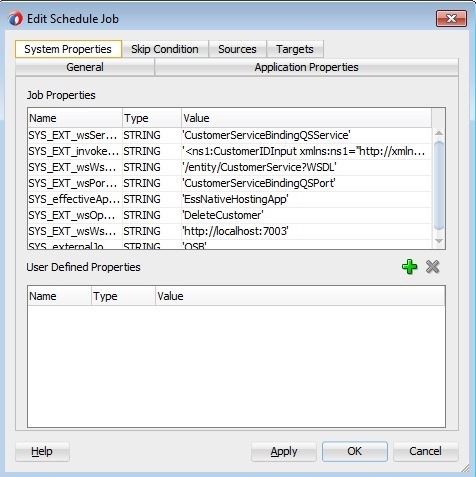 Create a BPEL process that accepts a string and returns another string. 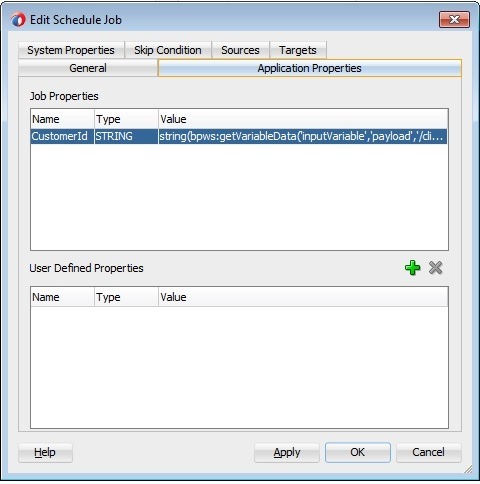 Create a java embedding activity with following code to verify whether the cache contains a value or not. 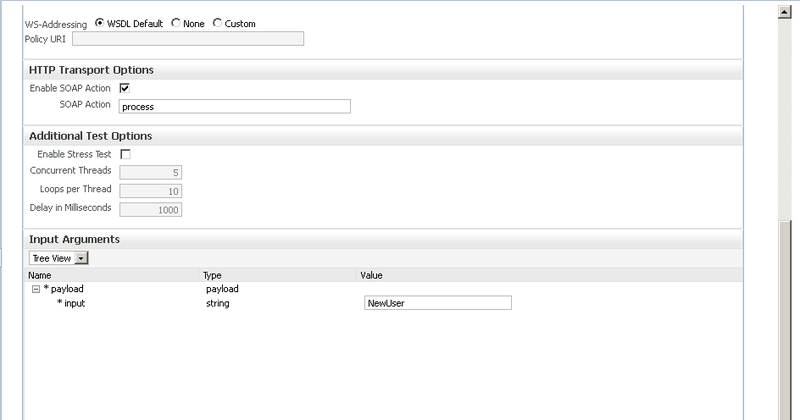 Create a switch case in BPEL flow to call the actual service if the cache value does not exist for the token used. The following expression can be used in the switch case. If the value is retrieved from cache, copy the value stored in ‘var1’ variable to output variable and do reply from BPEL process. Otherwise store the value we have got from the actual service in cache by using another java embedding activity with following code. Run the BPEL by giving the value for ‘input’ element that does not exist in the cache currently. Here in this case, we are sending it as ‘NewUser’. Observe that partner link has been called to get the result. 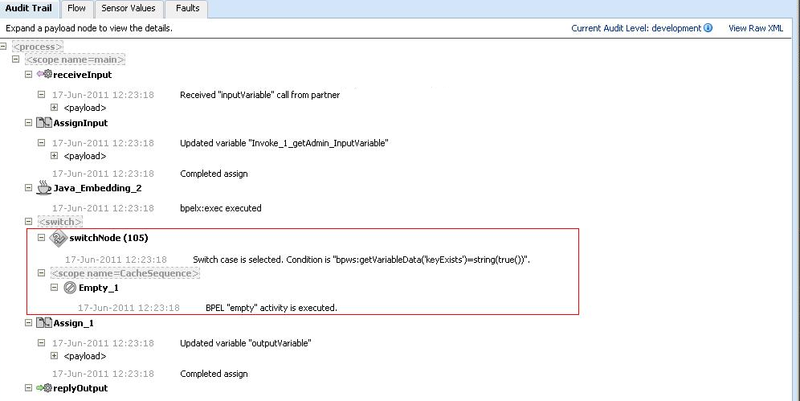 Observe that partner link is not called and the result is fetched from the cache as expected. 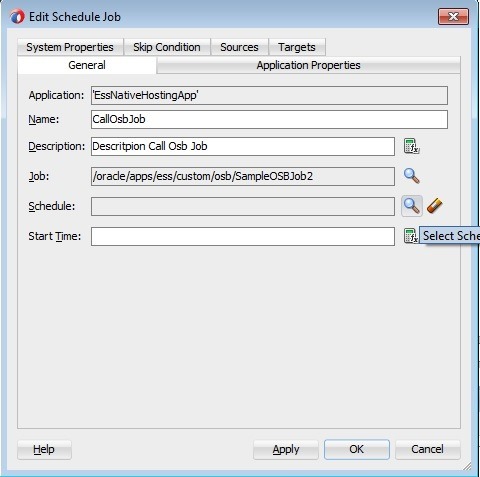 Create a configuration parameter or BPEL property to specify whether cache has to be cleared or not. 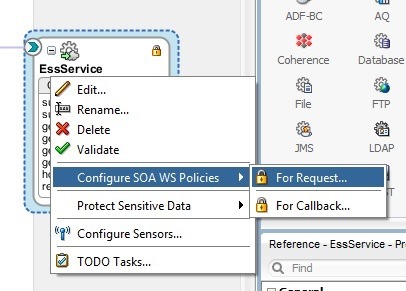 Modify the above switch condition to include this OR condition so that the existing cache will be reset by fetching the value again by calling the partner link.